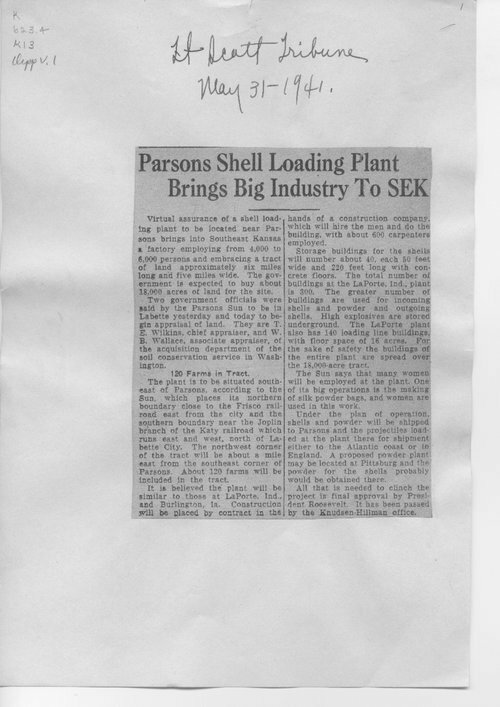 This newspaper article from the Fort Scott Tribune details the size of both the buildings and the labor force to be used at the shell loading plant in Parsons, Kansas. Once built, the Parsons plant produced artillery munitions throughout World War II. This item can be used to introduce students to the efforts of non-combatants in the U.S. during World War II. Call Number: Newspaper Clippings, Kansas Ordinance Plans, Parsons, K623.4, K13, Clipp., V.1, p. 1-78.